My host, Shane Courtland, was fun to hang out with as well (even if he is a Hobbesian). His office is filled with action figures, ranging from Darth Vader to Walter White. Less delightfully, my bag took a couple of days longer to get back from Duluth than I did (and Delta told me it had delivered my bag to me fifteen hours before it actually did so). In other news, over the next couple of days Ill be at my departments annual conference. Can’t say that I’ve spent much time in Duluth. But I want to check it out, and will! After I’m given a few more lifetimes to complete my higher priorities. Holy tamoli, that looks like a big lake. It makes me wonder: But isn’t Duluth a port city? That view looks (at first) like a view from a beach, onto an expanse of water that goes beyond the horizon, and not a view across a bay or inlet such as I would expect in a port city. 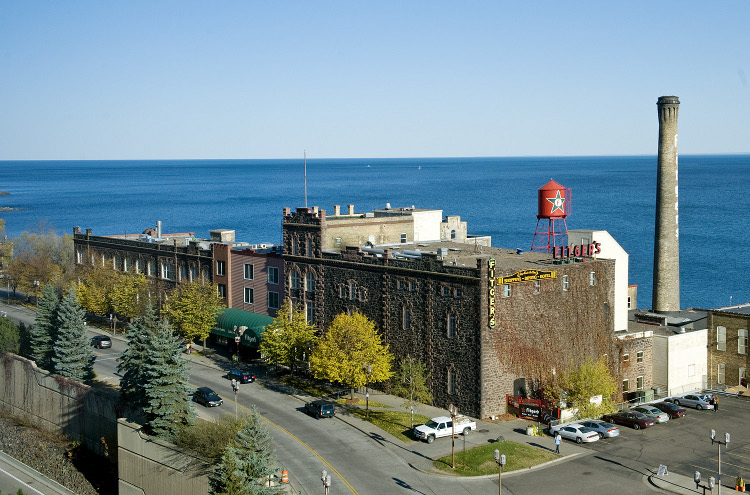 But after looking at Duluth on Google maps, and again at the picture, I have convinced myself that I can see a strip of low land on the far horizon. So never mind. The second half of slide 26 seems a bit unfair, since (a) I assume you’re referring to me, and (b) I’ve published at least one paper and several blog posts examining precisely what you say I (or “many BHLs”) ignore. This is more nuance than I had time to go into, but when I say “ignore” I don’t mean “never mention,” I mean “de-emphasise and/or usually don’t mention.” Thus I take the posts you cite to be a defense of “ignoring” (in that sense) rather than a counterexample to it. Actually, neither Matt’s paper nor the several blog posts he cites examine “precisely” what Roderick is discussing in the second half of slide 26. Matt’s work is about exploitation. Roderick’s slide is about the path-dependent sub-optimality of the option-sets faced by the poor. There’s no intrinsic connection between these two topics. You can demonstrate that people are not being exploited by their employers without causally explaining why their options are structured as badly as they are. When I was a dept chair (2011-2014), I regularly hired adjuncts who got a bad deal from my (private liberal arts) college–terrible pay, terrible conditions. I did the best I could for them. I neither coerced nor exploited them. But their options still sucked. (As did mine, for the nine years I spent as an adjunct.) It’s an exaggeration with some truth to it: my institution is regularly called “the sweatshop” by people working in north Jersey Phil Depts. The causal explanation for the suckiness of my adjuncts’ options does, as Roderick implies, have a lot to do with government interventions into the higher ed market. I’ve read a lot about adjuncts over the years at BHL, but have not read very much discussion of the latter fact, at least by the people in charge who write the posts. Whether the same under-emphasis holds true (mutatis mutandis) as a general proposition about the libertarian literature on sweatshops, I don’t know, but I think it holds true of BHL as a blog. The recent discussion of adjuncts by Jason Brennan at BHL is very much a case in point.